After Venezuela’s direct neighbours, Brazil and Colombia, already stifled rules for refugees of the Maduro regime to apply for asylum, many of those that try to flee Caracas headed to Peru or Ecuador. Those two nations now have also installed additional demands as they are being overrun by Venezuelan refugees. According to the United Nations’ official statistics, some 2.3 million Venezuelans have fled since 2014, though aid workers in the field say the actual number is far higher. Some 1 million of them are now stuck in Colombia, with many using the mountainous nation as a bridge to Ecuador and Peru, where they hope to find a job and apply for asylum. Related coverage: <a href="https://thegoldwater.com/news/33151-Venezuela-President-Maduro-Blames-US-Columbia-for-Assassination-Attempt">Maduro blames US, Colombia for assassination attempt</a>. However, seeing the large influx of recent weeks, authorities in Peru announced they would follow Ecuador's decision to require Venezuelans to enter with a passport, a document which has become near impossible to obtain in Venezuela. Colombia has criticized its two neighbours for their administratively imposed rule as this would mean most Venezuelans stay on their soil. Mr Christian Kruger Sarmiento, director of the Migration Colombia agency, said: "Demanding a passport is not going to stop migration because this population is not leaving the country for pleasure but out of necessity." "The first thing that will happen… is that it will see an increase in undocumented migration. That brings a lot of problems with it." 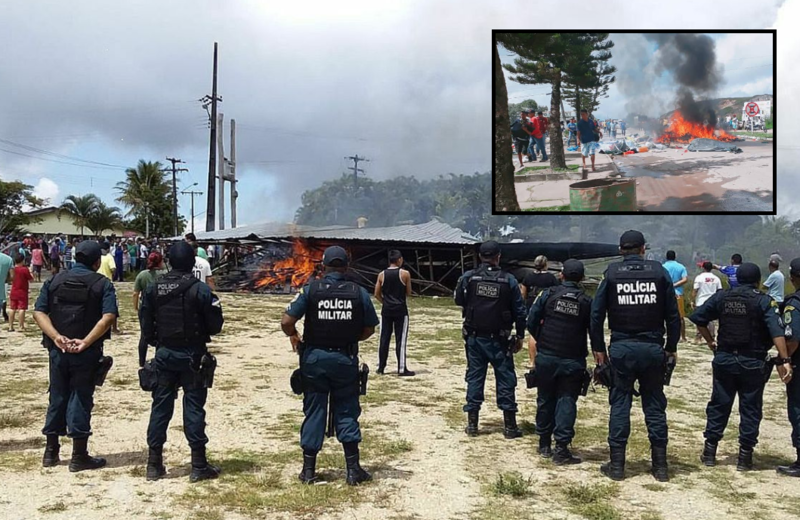 Violence has flared in the border state of Roraima where thousands of Venezuelans live in precarious accommodation. Hundreds of Venezuelans fled back across the border and angry Brazilians set fire to the belongings they had left behind. On the Venezuelan side of the border, there were reports that Brazilian cars had been attacked. Ecuador is right to do so. Very sad situation for these victims of Socialism. Just wait till our New Democrats the alt-left socialists start reeeing about their socialist comrades trapped in a human rights crisis and want to import them here instead! Or maybe we are not hearing it screeched from the tops of the mountain cause these poor souls probably realize socialism is the reason they had to eat from dumpsters and eventually flee their country? That’s not what the “dems” want. Lol! Whats this? The Government shooting its own citizens for demanding their Socialist Share to feed and care for their families, while the Elite Class have everything they want? Whats this? The Socialist utopia refugees are fleeing in droves to other countries countries and being stopped at the borders or contained in refugee camps because they DEMAND things? YEP!!!! SOCIALISM seems to have failed in South America for the 5th or 6th time. As usual there always seems that Rich, powerful fat cat Elite Class that has everything and is isolated from the suffering. Socialism is just another label for stealing $$$$$$ from lower classes so the Elite can't live high on the hog. At least with Capitalism everyone has a chance to move up the ladder.